Right and they will also be crying that the cost of everything has gone up a lot from food to housing . To be fair there are some min wage employees that seem to realize this might not be a good thing . So just end the free market instead of raising the minimum wage? Whats happening now? When the minimum wage gets raised the prices of all the necessities get raised too. Its a race to the sky between minimum wage and prices. The federal minimum wage should (and has been) based on the need to keep employers from paying taking advantage to pay desperate people next to nothing. Any city of state with a higher cost of living is welcome to establish their on higher rate. The system is working, with many cities and now states starting to go up to $15 gradually to help minimize the blow to employers depending on unskilled labor. This many years after the $7.25 went into effect (2009) I would expect that inflation would result in an increase, but to $8-9, not $15. Living on $15 in San Francisco is not the same as in Birmingham, Alabama, though the minimum wage is not meant to raise a family or buy a house anywhere. They tried to raise it here too (10.10 hr)... but the state stopped them. So many think minimum wage doesn't work here either. The thing is for most of these small businesses that will be affected , they aren't necessarily making more just because they are operating in L.A .
A business owner is going to have a higher cost in L.A versus Birmingham despite wages , having labor being more expensive is just another thing that will make the city less attractive for small business . If the burger or taco joint closes because they can't afford to operate paying $15 hr , then it's unlikely another burger or taco joint will replace it . This law will help to accelerate gentrification of neigborhoods , which is I'm sure something the pro $15 crowd would not like to see. What is better than these minimum wage laws is to allow the market to set the price . For example in oil boomtown North Dakota in 2014 , McDonalds was paying $11 hr and UP there NOT because of a law , but because the economy was so strong there they had to pay that much to find people to work . 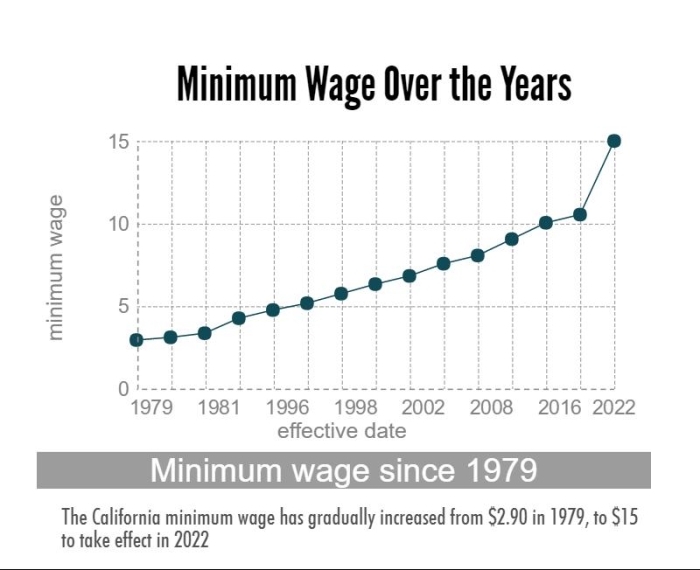 This makes a lot more sense than having government set the minimum wage as some arbitrary number . The market should set the wage . 1) Don't merchants in LA charge more for their products than merchants in areas with lower COL thereby having higher gross income? 2) What is the connection between a few dollars increase in minimum wage and gentrification, which is fueled by wealthy investors? 3) What incentive do business owners have to pay anything more than the lowest salary they can get away with if the "market" is allowed to set prices? 1) Sometimes , but not necessarily. If you are talking about places where minimum wage workers often work such as fast food or retail prices are usually pretty similar in other places . Even if prices were a little higher the much higher cost of doing business would eat that up. 2) Sorry thought I had made that clear . The connection is that if you make it unprofitable or unattractive for certain businesses like fast food , then they go out of business or relocate out of the area , the land they are sitting on will most likely be repurposed for another use . The building will be torn down or remodeled , of course this is already happening in parts of LA anyways but this wage increase will accelerate it . If you look at an area like Hollywood it's changing a lot and you will see fast food places that have closed down. There is residential gentrification but there is also business gentrification too . 3) As I had mentioned in the article above about the Bakken , businesses have an incentive to pay more in order to stay in business . Of course there is a fear that businesses will pay $1 an hour , but who is really going to work for $1 an hour ? It's just not going to make any sense for people living in LA and not Vietnam to work for $1 an hour . To strengthen this point , there are fast food places that pay more than minimum wage , even though they don't have to by law . IN N OUT is an example of this, but there is a pretty noticeable difference between IN N OUT workers and workers at the larger chains that pay minimum . Just the other day I was at a Del Taco and the guy was complaining to me about his coworker didn't show up so he has to work and he's "fucted"
An in n out worker would never say that . There are a lot of crappy fast food chains around that are poorly run , And I wouldn't mind seeing some of them close ... But on the other hand I realize that lots of people would be out of jobs if they closed . Even if the Del Taco guy is using swear words , at least he's working and not on the streets . Let's just have a revolution and make this the USSA. UNITED SOCIALIST STATES OF AMERICA. Then we can pay everyone 50 dollars an hour.